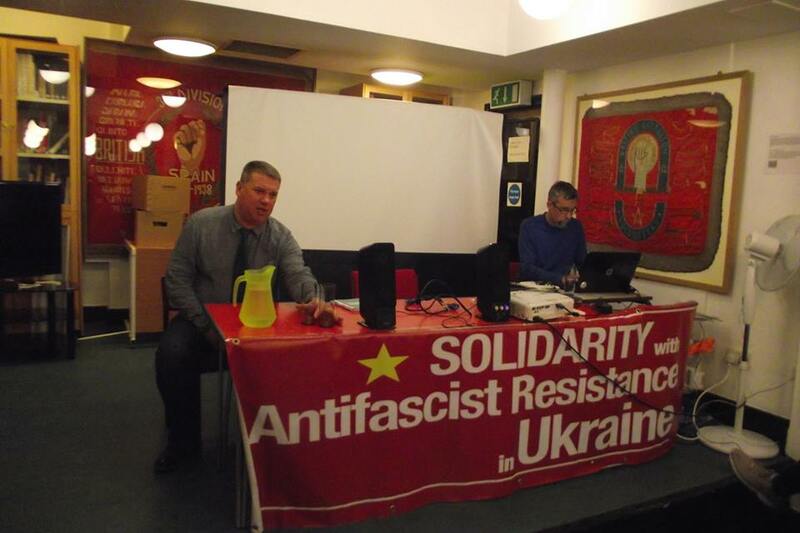 The role of the Western media in reporting the turmoil in Ukraine over the past two years was under the spotlight at a meeting organised by Solidarity with the Antifascist Resistance in Ukraine at the Marx Memorial Library in central London last Wednesday, October 7.Andriy Bondarenko, a journalist for Dnipropetrovsk Pravda, and member of the Dnepropetrovsk regional assembly for the Communist Party of Ukraine, and Roger Annis, chief editor of the website New Cold War: Ukraine and Beyond, based in Vancouver, Canada, were interviewed via Skype at the meeting. Bondarenko began by examining a series of new laws passed by the Kiev parliament, under which, he said, “the left media in Ukraine has ceased to exist, with no court decision, and all communist publications are effectively banned”. Bondarenko said that under the law on ‘Condemnation of the Communist and Nazi totalitarian regimes in Ukraine and banning of propaganda of their symbols’ which came into effect in May 2015, “In effect it is now illegal to publicly support or promote the symbols of the communist government of Ukraine which ended in 1990. This includes even expressing support for the collectivisation of agriculture, and carries prison terms of five to ten years. “It is also illegal to publicly express support for ‘separatism’, in other words for the anti-Kiev rebels in the Lugansk and Donetsk. But in reality, any opposition to the Kiev government or criticism of the military operations in the East are labelled as ‘separatism’ “. Bondarenko said while the Ukraine Communist Party was not technically banned, “In reality it is shut down. The editors of the newspapers ‘Working Class’ and ‘Christian Truth’ are in prison, and there is now only one remaining left publication in Ukraine, ‘The Worker’s Newspaper’ “. The Organization for Security and Co-operation in Europe has raised serious concerns about this law. Its Representative on Freedom of the Media, Dunja Mijatović, said in a letter to Ukrainian President Petro Poroshenko: “It is discouraging for freedom of expression and media freedom advocates in Ukraine that the law has gone into effect, despite various calls to safeguard these basic rights”. But while this law also outlaws support for ‘Nazi totalitarian regimes’ – a reference to the Ukrainian Insurgent Army led by Stepan Bandera which collaborated with the Germans Nazis WW2 and included members of the Nightingale and Roland Battalions of the German Abwehr – a separate law has created a new holiday, ‘Day of Defender of Ukraine’ on October 14, when traditionally supporters of the UIA stage fascist-style torchlit marches. This law sparked angry protests by the Polish President, and a wave of protests in in Warsaw, Krakow, Wroclaw and Przemyśl under the slogan “Lasting Shame to OUN – UPA Murderers from SS Division Galicia”, which were almost totally ignored in the Western media. He said the media had “whitewashed a series of crippling military defeats suffered by the Armed Forces of Ukraine in 2014 and early 2015”, which launched an all-out conventional offensive against the rebels in eastern Ukraine beginning in the spring of 2014, labelling them as “terrorists”. He explained, “On September 16 of this year, Ukrainian President Poroshenko issued a decree banning 388 foreign academics, political officials and journalists from visiting Ukraine. They were deemed to be threats to the interests and national security of Ukraine by the National Security and Defense Council of Ukraine. “While most of those banned are Russian, the list includes 41 journalists and bloggers from across Europe, and three from the BBC”. This decree, too, was criticized by Dunja Mijatovic. Annis said other limitations on Ukraine’s media include a law passed in April 2015 banning Russian films and television series made in Russia after 1991 deemed to contain “positive depictions” of the Russian government, police and armed forces, and banning any of any films or television series considered “anti-Ukrainian”. Over a dozen Russian television news channels were banned from Ukraine’s airwaves in 2014. Annis has reported that in August 2015, the Security Service of Ukraine opened a criminal investigation into Lviv-based Folio Publishers for publishing or selling 38 books, including several published reports on the human rights situation in Ukraine. Ukraine’s national security police, the SBU, claims the books are part of a secret operation run by the Russian domestic security agency. The array of repressive laws in Ukraine have to be seen in the context of widespread violence in the country over the past two years, including the destruction and burning of offices of the Communist Party and trade unions, the ‘disappearances’ of many people opposed to the Maidan Coup of February 2014, and repeated desecrations of the Babi Yar Holocaust Memorial in Kyiv. The latest attack at Babi Yarer occurred on September 14 and was the sixth so far this year. Annis gave an example of the violence and atmosphere of terror in Ukraine in the shooting death of journalist and Euromaidan critic Oles Buzina on 16 April, in front of his home in Kiev in broad daylight. “The two members of far right organizations arrested for the murder have become folk heroes among their far-right supporters, with hundreds of Right Sector and Svoboda Party members demonstrating in Odessa demanding their release,” he said. Annis referred to a survey carried out in June by the Center for Sociological Studies in Ukraine, which he said “was in sharp contrast to the narrative promoted by the Western media”. The survey showed that two-thirds of those polled believed the situation in Ukraine was going “rather” or “definitely” in the wrong direction and 88 per cent believed that President Poroshenko and his government were “fully” (40.4%) or “partly” (47.9%) to blame to blame for the dire state of Ukraine’s economy. The survey also showed that 82 per cent felt the government was not “doing everything necessary in order to stop the armed conflict in the Donbas”, 48.7 per cent said the government was “doing something but not enough”, and 33.5 per cent said that “practically nothing” was being done to end the war in the east of the country. A sizeable majority of those surveyed, just under 62 per cent, said “the most important thing” was “to stop the war in Donbas, even if you have to give up the occupied territories”, rather than to “continue to fight” until Kyiv government control was restored in the Donbas region. The meeting also heard from Giles Shorter of Bristol Ukraine Anti Fascist Solidarity (BUAFS), which has held a weekly picket of the BBC in Bristol for over a year. Giles said this was “to draw attention to the lies they tell about the conflict in the Ukraine and Donbass, and to point out how this conflicts with the vaunted status of the BBC as a paragon of objective and balanced journalism”. The interviews were followed by a lively discussion on campaign priorities led by Alex Gordon, chair of SARU. These included protests outside the BBC and the Ukrainian Embassy, developing work with the Stop the War Campaign on the issue of British troops deployed in Ukraine to train Armed Forces of Ukraine members, and with anti-fascist organisations in Britain, and the production of a dossier on the far right in Ukraine for circulation in the British labour movement. This entry was posted in Articles, Events and tagged Bondarenko, media, Ukraine. Bookmark the permalink.